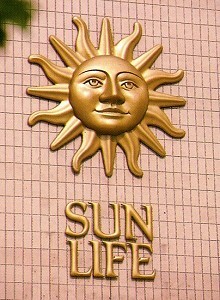 Sun Life Insurance's 'Sun Face' emblem (2m diameter). As well as heraldry, we specialise in interpreting company emblems, logos, trademarks and insignia in sculptural relief for internal or external use, in any size. 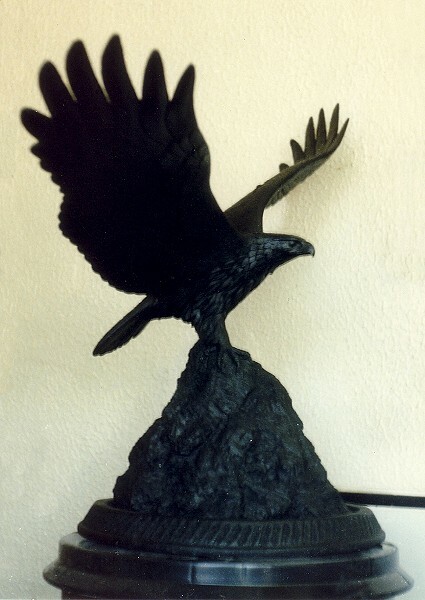 When large corporate bodies commission works of sculpture, the intention can range from the creation of a purely fine art work to enhance the environment of their premises, to the sculptural interpretation of their logo. Sometimes they will have an emblem which is very pictorial and lends itself well to sculptural interpretation. 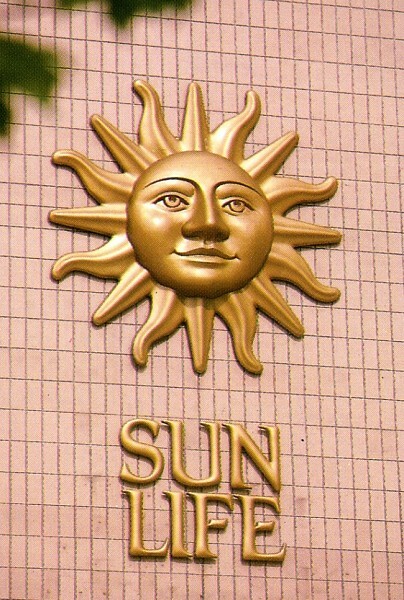 A good example is Sun Life Insurance’s ‘Sun Face’ emblem. Until they approached Bryan Rawlings Design, the emblem had only been used in a two-dimensional, printed form, but they wanted their headquarters building in St James Barton, Bristol, to display their brand as a striking sculptural image. Firstly, I modelled a maquette, about one quarter scale, of my conception of a sculptural rendition of the design. This was submitted to Sun Life and approved. The next stage was to make a full size version - 2 metres in diameter. I prepared a large rigid board and set it up nearly vertically, as it is important to be able to step back and view the modelling from a distance as the work progresses, and marked out the design, full size, on the board. The ‘rays’ of the sun in the design alternate straight and serpentine, so I modelled just one of each type and made a GRP mould. This enabled me to mould eight of each exactly matching. I trimmed these and attached them to the board, which left just the face to create. There is no easy way to do that part. Aware that there is going to be a huge weight of clay suspended on this near-vertical board, I start by screwing large slats of wood securely to the surface to support the clay. Then it is just a matter of pushing handfuls of clay onto the board, gradually forming the three-dimensional face shape that I have in my mind. Chariot sculpture made for Hotel Intercontinental. As the form takes shape I work in more and more detail and smoothness of surface, using various modelling tools – some bought, some hand-made, some bought and re-shaped. Throughout the process it is important to move away from the work to a position where you can view it as a whole. Eventually, when 100% satisfied with the form, I prepared the surface with sealants and release agents and made a GRP mould. Once the GRP was fully cured, the mould had to be prised very carefully off of the board – at this stage it still contains several hundredweight of clay! I put some sturdy cardboard boxes on the floor for the mould to fall onto and ease it off the board. Next there is a laborious job of digging all the clay out of the mould, prising out the GRP ‘rays’ and cleaning the mould surface. Then a fresh application of release agents, and more GRP work to mould the first ‘sun face’. I made three sun faces to face in different directions on three outside walls of the building. Another part of the job was to make the ‘SUN LIFE’ lettering that is all part of the logo. It would have been easy to have made these using normal sign making techniques as flat cut-out or built-up letters, but in conjunction with the rounded surfaces of the sun face and also in consideration of the character of the letters, they suggested to me a rounded, ‘cushioned’ shape. The only way to achieve that, and to give the effect that I was after, was to model each letter individually, and make individual moulds. Using those moulds I produced the three sets of lettering. 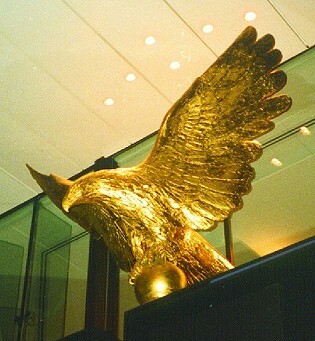 The London eagle sculpture, which had a 3m wing span, was mounted over the entrance to their offices in St Mary Axe in the City of London. It survived the IRA bombing in 1993 with moderate damage to one of the wings. 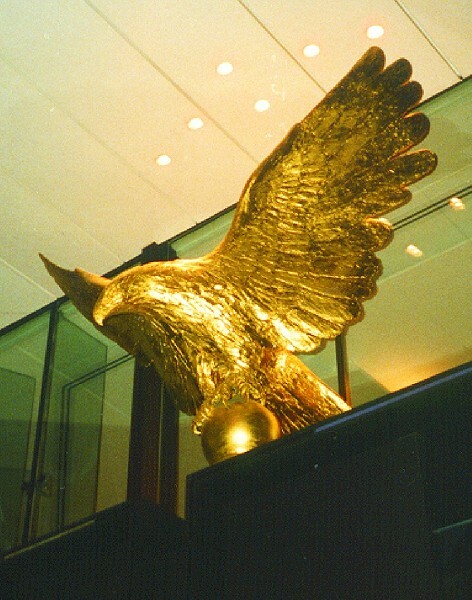 Eagle Star returned it to my workshop where I repaired the wing and re-gilded the sculpture (it was finished entirely in 23.75 carat gold leaf), and then replaced it over the entrance canopy, where it remained for many more years. We were commissioned by British Aerospace to make the bronze plaque shown above. It depicts the history of their Strand Road East Works in detailed relief. 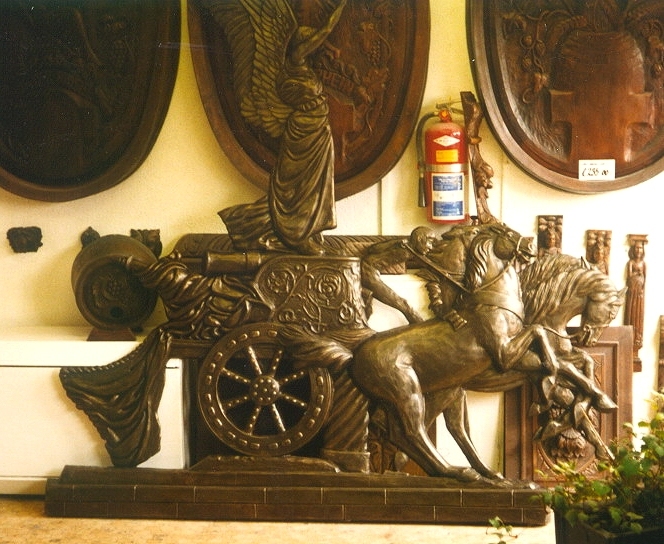 The plaque was cast in bronze using the lost-wax process. 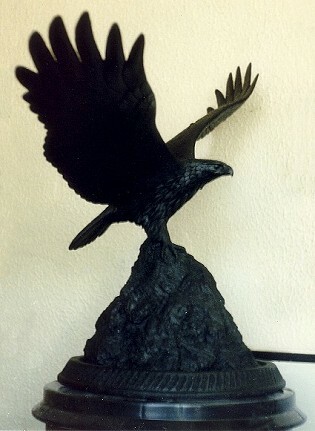 Eagle sculpture commissioned by Eagle Star Insurance.